The most frequent request we have received from customers over the past decade or so, has been for the ability to import a solid model directly into the control and program conversational features from that solid. Well...the wait is over. 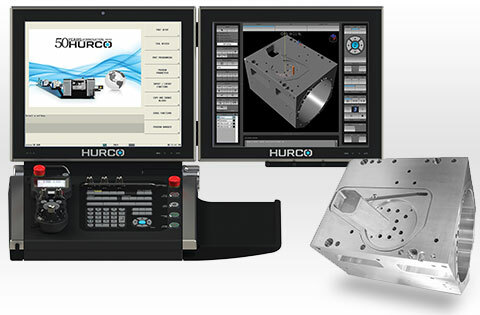 Hurco released the 3D Import feature at IMTS 2018 and it was a huge success. This past weekend I was lucky enough to attend the commissioning of the US Navy’s newest nuclear submarine, the USS INDIANA. In January of 2017 I posted an article about getting to meet the crew of the Indiana; in September she was christened, and now, after the September 29th ceremony, she is a full-blown US Navy vessel! For the ceremony the US Navy activated a 100 year old Captain – who was an original Plank-Owner (original crew member) of the previous USS INDIANA battle ship – to pass the official ship’s telescope to the skipper of the current USS INDIANA. It was awesome to see the support provided to this effort by the entire state of Indiana. As the name-sake for this amazing boat (the Navy calls submarines “boats” and not ships) the state of Indiana stepped up in a big way. All 92 counties provided something for the crew of the Indiana. Individuals and clubs or organizations worked countless hours on gifts and donations. Dining tables complete with an Indiana collegiate sports theme, made from Indiana sourced veneer will adorn the mess hall. A humidor and three poker sets – all hand-crafted from oak wood sourced in Constitution Grove located in Crane, Indiana - will give the officers and crew something to do in their down time. A teak wood bar top – made from a section of the actual deck of the WWII era USS INDIANA BB58 – will be placed in the Chief’s lounge and will offer them many hours of “recreation” to help pass the time. Purdue University also provided a beautiful replica of the Bicentennial torch that was carried all across the state during the Bicentennial celebrations. In addition to providing machines to the companies who actually built the USS INDIANA, Hurco’s involvement was also a bit more personal. The insignia of the US Submarine service is a warfare pin that includes a submarine flanked by two dolphins (fish not mammal) on either side. These pins are symbolic within the community of submariners, and synonymous with submarines throughout the Navy. As Hurco’s contribution we machined a set of these dolphins for each member of the USS INDIANA crew…and since the state of Indiana is known for limestone, we machined the symbolic dolphins out of Indiana limestone!